Can you do better? Although this is probably a once in a lifetime combination, I think East’s best continuation is 3H, forcing (the higher of North’s declared suits). West will call 3S (second suit) and East will find a way to get to the Grand Slam. With no mechanism to his arsenal, our poor East took the bull by the horns and missed his target. Here is the bidding sequence at the table. Before tabling his cards, North inspected the backs of the cards just in case two decks had become mixed. Alas, not so. From the bidding and his perspective, it appeared there were about 50 HCP in this pack! Not quite what South had hoped for but he also realized he might should have doubled 5S for a certain plus score, based on his partner’s bidding. South had fancied his hand, and thought partner might have had the required ‘goodies’ from his bidding to bring home the slam. No time for wishful thinking, back to the task in hand. West continued with the spade ace, ruffed by South. A heart to the queen exposed the news. West was void in trumps and thus East holds five to the ten! This turned out to be advantage South although many declarer’s might have turned pale at this disclosure. The last trump from Peter’s hand to take care of East’s last trump was the beginning of the ‘coup de grace’. A diamond discard gives declarer three diamond tricks. South leads the diamond queen, smothering the jack in East, returning to the ten to win the long diamond. Then follows a simple finesse in clubs to win the required balance of tricks. A club discard at this point gives declarer three club tricks. Declarer takes two diamonds, as before, and then the three clubs, again with the simple club finesse. A simple squeeze but would you have found this excellent play. East passes and partner, South, opens 1C (four card suits natural). West doubles! Our arrangement is redouble 8+ hcp and a pass is ‘happy!’. 1NT is artificial and is meant to warn partner not to repeat his / her suit. Having not played regularly for six months, my partner has been in the States, I forgot this latter escape bid and bid 1S and prayed partner would pass. She repeated clubs and I passed. She got off for one down and they had little to make so an average score. Do you have a system for hands like this? East opened 2S (weak), six card suit, less than an opening hand – (Have you read Bruno Wolff Jr ‘s article on ‘Disciplined Weak Two Bids’ in ACBL bulletin April 2015? It is well worth studying for those of you using weak two’s. If you cannot put your hands on a the magazine, send me your email and I will willing send you a copy of the article). Partner passed and West bid 4S with a smile on his face. I knew I had been fairly and squarely put out of the auction (or had I?). In this situation, in our way of playing, 4NT signals two playable suits (not spades) and partner is requested to bid suits upwards. Double is for penalties. I must have sat for a while cursing my RHO and recalling our arrangements. Finally I decided 5H had to be correct, passed by all. An immediate ruff, draw trumps and eleven tricks (six hearts and five diamonds) landed the contract. What would you have done? I was vulnerable and they were not. I was lucky but the double would have netted +300 against +650. Fortune favours the brave! Adios from a summery Mérida. Only 36°C today. Here are two hands that produced a little merriment in our local tournament. The bidding: a little exotic! I cannot even begin to explain this bidding sequence. North decided to open a 5 card major instead of a 6 card minor (rather fortunately for us). My partner, with 5 losers (a strict losing trick count proponent) decided to bid 2D (Why? I think the translation for Spanish was that diamonds was the stronger suit!. The lessons have to continue). South absolutely correctly bid 2H. I, as West, assumed partner to have a genuine overcall and, despite the clubs and the knowledge that East is void in hearts, reckoned that on a heart lead, the expected lead in this school, we were close to 3NT, running diamonds and at least a couple of heart tricks. North now bid his clubs, understandable, and partner now bid her spades! South supported North’s clubs at the five level, 5 diamonds from West and North got angry. Partner had no trouble in landing the doubled contract. The discussion, in Spanish, was ‘Fast and Furious (not the Holder type). Chalk up +550 on board 1. Cannot be a bad start to the evening. The next couple of hands passed without much comment and then we were dealt this board. The bidding: a little less exotic. As explained in an earlier article we do not play two suited overcalls and East thought she should bid suits upwards (The unfinished lessons) to conserve space for our bidding. North’s 2N showed 18/19 HCP but I think a heart call might have been wiser. Partner, unabashed found a 3S bid, after all she was going to bid twice and the suits upwards (sic) and imagining something like a 6/5 distribution on the bidding with most of the missing honours with North, I fancied game in spades. Again North doubled in anger! Do you blame him? A small heart was led to the ace and North tried cashing the heart king, ruffed by East. East tabled the club king, that was taken immediately by the ace, fearing a singleton. The third heart was ruffed by East and a club led to the table. The singleton diamond was led from dummy and North grabbed his ace, perhaps not a good move but understandable. Out of hearts, North retuned a diamond ruffed on table. The spade jack delivered the ‘coup de grace’ against North. Ten tricks doubled vulnerable. Again the conversation centred around North saying he had 19 HCP and potentially five tricks. At least that is what I understood from the Spanish. Not good bridge but it made the evening for me. I must get partner to understand bidding strategy (or must I?). Saludos to all our friends in Pretoria. This will probably be my last article as there is little interest shown in the blog. I think it has been decided to close it down. For those few who enjoyed the articles; thanks, I enjoyed writing them. A little bit of humour at the table goes a long way. In a friendly home game of duplicate, South, playing 5 card majors, opened 1♥. North held the following cards. Why did I raise 3♥ to 4♥ you should ask? We were not having a good evening and I felt we needed a bit of luck. The defense started with three rounds of diamonds, the third diamond being ruffed in South. Trumps were drawn in three rounds ending in South. King of spades produced a little spade from each opponent. The spade jack was tabled (ostensibly unblocking the suit) and when West played low, the ace was called for, felling her majesty from East. Eleven tricks made. East opened 1♣. My Spanish partner does not understand two suited overcalls and my Spanish is not (and never will be) sufficiently fluent to explain them. Thus I simply called 1♥ not being aware of the monster hands that faced us. West called a simple 2♦ and partner overcalled 2♥. East, a very good player from South America, Switzerland and Mérida at this point looked extremely uncomfortable. After some few moments of agonizing, looking at the ceiling etc., he bid 6♦ which of course made with an overtrick. Back to the drawing board. East’s hand is surely worth a bid of 2♣. In a normal school, non vulnerable South will show spades and hearts (if possible) or simply overcall in hearts (as happened here). West has a positive hand and will show diamonds. Many North’s, having complete faith in partner’s overcall discipline, will support hearts. Back to East’s problem. Is a jump bid in spades now a cue bid, agreeing diamonds, or simply showing a big hand in spades? 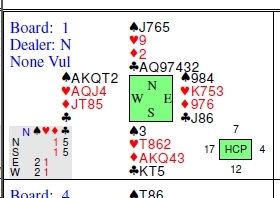 If it is a cue bid, West will easily find the cue of hearts and 7♦ is easily reached. My very International friend could not solve the problem and laughed when West put the ace on the opening heart lead. Try this hand on your partner! A very Happy New Year to all our friends in Pretoria Bridge Centre. May the joy of playing the game far outweigh the frustrations of its vagaries. We wish everyone all the very best in the New Year – Joy, satisfaction, peace, good health and contentment. We send best regards to you all. You are always in our thoughts. As I tried to indicate in my posing of this problem, there are two parts to this story. South’s claim of unfair play by West and West’s unfortunate fumble / hesitation at Trick 3. Let us analyze each in turn. The book ruling, as I explained, in 73D (1) is that inferences (from such variation) may appropriately be drawn only by an opponent and at his own risk. According to the Law therefore, the score must stand as down one and North South appear to have no redress. South’s play was based on the odds and his inference that West started with K and four, from the hesitation, is only an inference, and as I said, ‘caveat emptor’. The score should stand. With two cards in any suit West should never be caught napping. Thus the variation in tempo / fumble, call it what you will, might be seen as gamesmanship. From West’s point of view, on seeing dummy after the diamond lead, he knows partner has at best a singleton in the trump suit. He can see his two trump cards, dummy has three cards, South has seven cards (from the preempt) – Partner has a singleton. From the lead of the queen, partner’s singleton is the king! Thus even an average player, as West, would have known that his partner had a singleton king and that any irregular play on his part might be misconstrued. Thus a smooth play at trick 3 was essential. Note: It does not matter what card he elects to play as the Law (73E) states clearly that a player may appropriately attempt to deceive an opponent through a call or play…. So the only real problem is the fumble / hesitation knowing partner had the singleton King. Now we get to the heart of the problem as I perceive it. One must assess the deliberateness of the fumble. Note this does not, in any way affect the outcome on the scoresheet. Have the club ‘black book’ ready. Is West anything more than a beginner? A poor player probably would not have worked it out and was probably wondering what their system was, he has vague recollections of high – low from a doubleton, wonders whether this applies to trumps etc… all time consuming thought processes for the beginner. Finally he arrives with the four. Remind yourself to quietly and nicely explain to West after the event, the impact of his hesitation / fumble and to try to be more alert when playing as a defender. Note, you do want to see their faces again. So do it privately and as quietly over tea as you can. No entry in our black book. If West is a moderate to good player, I recommend an immediate procedural penalty to East West. [All procedural penalties should be noted in the club black book]. Explain, immediately at the table, that this hesitation, although possibly inadvertent, is certainly not in the spirit of the game. A quick “Sorry – I had nothing to think about or some such remark would have been more appropriate from West before South played from dummy. West should have been aware of the potential damage of his fumble but at least he should have tried to mitigate his error’. If West is a club expert, I have no hesitation. Enter in the ‘black book’ that West is using serious gamesmanship, award a procedural penalty. Maybe, as a very good friend of mine (a Director) was want to say, “Lock the doors of the bridge club, and throw him through the doors”. What else? So! There you have it! Not quite. Now you ask; ‘What about Law 73F?’ Too long to quote here but in essence ‘…. An opponent, who had no demonstrable bridge reason for the action (in this case the variation in tempo) and who could have known, at the time of the action, that the action could work to his benefit, the Director shall award an adjusted score (see Law 12C). Note that the play of the four (in tempo) would be a legal play, devious but quite legal. Because the same card is played out of tempo does not make it an illegal play! The punishable offence here is, for better players, the fumble / hesitation not the exact card that probably induced South to finesse. This infraction has been dealt with a procedural penalty against the better players, but certainly not against beginners. The magnitude of the penalty is entirely up to the Director and cannot be overruled by the Appeals Committee without consultation with the Director. One other thing to note. An artificial adjusted score (60% in most cases) would certainly reward North South for a bad slam. In my opinion this would be a poor action by the TD that should certainly be appealed by East West. It is a pity that this entry caused no discussion from those interested in giving rulings. Maybe my thoughts on the matter (and I stress that these are probably not the last words on the matter) might provoke other opinions. Who wants to be a Tournament Director? In the ACBL magazine for March, there was an interesting article on hesitation that set me thinking. Here is a hand (hypothetical) that should have all you potential Directors running for cover. The bidding on my dream hand was easy. 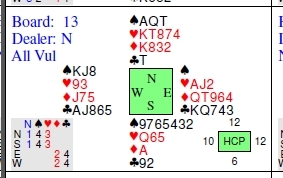 South, to open, pre-empted 3S and North, after establishing that South had neither the ace of diamonds nor the king of trumps, became ambitious and took the final contract to 6S. West led a nondescript diamond, the king losing to East’s ace and the diamond return, was won by South’s queen. In the trump suit, the ‘apriori’ odds favour the finesse and thus South led the queen of spades. West fumbled, hesitated and finally produced the four. South, missing exactly king, four and the two in the trump suit, decided to proceed with the finesse, losing to East’s singleton king. One down. DIRECTOR!! How would you feel as South? Hard done by? What, as the ‘poor’ Director, would be your ruling and whose feathers are going to be ruffled? Remember the maxim in bridge for declarer is ‘Caveat emptor (beware the buyer Law 73D (1))’ but could West’s hesitation and final play of the four (See Law 73F) from the four and the two be grounds for the application of Law 12C, an adjusted score.? To all our Jewish friends at the Bridge Centre, we, Glenda and I, wish you a joyful and peacefully Pesach. Love to you all. We miss you and remember you with love. Here is a hand from Saturday that caused a few raised eyebrows (certainly mine) and a lot of heartache to both sides. The simple question is “Do you open on this hand and if so, what do you open?”. Please choose before you continue. As I see it there are several possibilities. There will be those whose system is convoluted and have a bid that is equivalent to 3C but ‘transfers’ the hand to partner. Personally I am a proponent of the straight pre-empt (I am too simple (I try to use the KISS system as much as possible) to use convoluted transfers. I am also very nervous about long one suited hands not being explained on the first round of bidding. Some partners get very ‘picky’ about the strength of repeated bids of the suit). [Strangely enough, my partner, who believes in the abovementioned four card major mantra, believes the hand should still be opened with a natural 1C. Her explanation follows very logical lines – 11 cards in the two longest suits, with seven points and six losers, certainly constitutes an opening bid according to the South African Conventions Control treatise, so I am not going to be critical. Also I trust my partner’s judgement ‘almost’ as much as I trust mine therefore not too much ‘anti’ from me on this one!]. With so many different contracts on this hand shown on the score sheet, with so many differing results, I will try to concentrate on the consequences of North’s choice of opening bid. This will be pertinent to this particular hand, and subsequently I will try to assess the pro’s and con’s of the opening bid philosophy and dogma. Firstly those who chose to pass on the North hand. [This I consider tantamount to criminal! ].East will pass and South will probably open 1D. West with two majors should double but, alternatively, might intend to bid twice, first in spades and then hearts, showing 5-4 and a fair hand. Over either bid North should bid clubs at the level that their system permits. [For us, three clubs shows a long suit denying support for partner. For others 2C is sufficient]. Over 3C West having bid spades should bid hearts, and having doubled originally, should double again! Over 2C, South should raise to 3C, in case North has a better than a ‘bust’. Hapless West might bid hearts at this stage, having mentioned spades, or double, having decided to double at his first turn to bid. What West should not do, having bid spades, is to double 3C for take out at this stage! At one table, West decided the double at this stage was forcing; East decided it was penalty, and, due to a slip in defence, North rolled in 12 tricks, doubled, for a superb undeserved top. If North South were now to push in a major, South or North will push back in clubs and certainly should bid the ‘very icy’ game in that suit. [Obviously those pesky Pretoria flying cows were around on Saturday, as three pairs in this game made only ten tricks! Oops!]. A major suit bid by East West at the five level adds support to the age old maxim that the 5 level belongs to the opposition; a golden ‘rule’ in bridge that several EW’s found to their dismay! Now for those who found what I consider to be the sensible opening bid of 3C. I do not believe for one moment that four to the jack in spades should disqualify one from pre-empting on this hand. The bidding will then proceed as follows:- pass by East and 5C by South!! Finito!! OK. West it is your turn to bid. If you open your mouth with anything but ‘pass’, your proverbial foot will be placed firmly in your proverbial mouth. Five clubs doubled should roll (I will not count those watching the Pretoria cows) and any five level contract by East West is doomed. I am sure South will confirm this fact to all and sundry with his next bid by doubling. Black box says 5H is scheduled to make seven tricks, four down doubled -800 and 5S three down doubled for -500 against NS’s probable non vulnerable game. For NS this is surely the easiest of sequences, supporting my contention that the pre-empt tells the whole story in one bid. For East West the pre-empt becomes their ‘Waterloo’. Should North decide to open 1C, East will surely pass and South should bid 1D (unless this is some artificial negative in which case South should bid 1D – yes! 1D – you will get to bid again!!). West will double for the other two suits and North should repeat clubs at the two level, showing a sub-minimum opener. East will surely pass. South raises to three clubs, or four clubs, and West doubles again (take out please!). North passes. East, poor East, bids hearts and South is having none of it. He can count partner with singleton or void in hearts, and with his strong diamonds and the spade singleton should roll out the bid of 5C. West is fixed. He has bid his hand and should pass. Any attempt to bid 5H or 5S will be summarily dealt with by South. A double of the 5C bid is equally fatal. So. There you have it. Bridge at its best. Which opening bid is the most effective? On this hand, and I know of many others, the simple pre-empt is the most descriptive. Firstly it is always used as a descriptive call. Secondly it is designed to be destructive to opposition bidding room. So, as a philosophy, use it for its intended purpose. There are many chapters in books written on when and when not to use the bid. Use it often and effectively. One thing that one needs to agree on with partner beforehand; all continuation sequences after using the bid. Typically a new suit bid by partner is asking and forcing [Pre-emptive bids are never to be rescued. This creates very bad kharma between partners.]. 3NT by partner assumes you have the semblance of a side entry. Take it out at your discretion. Partners have been known to moan all night if you prove to be wrong! Support in the new suit, being three cards in that suit or an honour with an extra card, then raise partner in that suit. (1) No support for diamonds and no outside semi-control in spades or hearts! I love pre-emptive bids. Don’t you? It is not too difficult to see that North will open the bidding with 1H. South will call 1S. North should call 2D, indicating 5 cards in hearts and 4 cards in diamonds (and an opening hand!). South, with three hearts and a somewhat scant seven card spade suit should bid 2H, but most will find the bid of 2S. Over 2H North should bid 2S. Why? South is marked with a minimum of 5 spades as with 4/3 in the majors he would have simply bid 2H at round 1 of the bidding. With the ace, queen and ten, North should find this bid confirming the double fit. After this South with the diamond ace, fair hearts, knowing partner has but one club and three trumps will surely push to game in spades. The lie of the spades is favourable, despite the less friendly break, and North South should make ten tricks for +620. Over the less attractive bid of 2S by South, North will certainly show support, game will be reached in spades, and the same +620 will be recorded. Certainly this is a difficult hand to bid and a little ‘pushy’ to get to game. The lucky lie of the spades allows South to make the contract. That it as easy as it gets. If you were brave enough to bid game and make it, feel satisfied. You have reached the best possible score, under normal circumstances, for your side. A relatively easy passage was engineered to a good game contract. If you fell short, start to feel a little uncomfortable, as the play is fairly simple and most pairs will get there, thus your + 170 may give you a poor match point score. If you made less than ten tricks, go on to the next board quickly. It is very likely you have a poor score. Now let us introduce the opponents. Sitting East – West, vulnerable, you hear North open 1H. As two suited overcalls are today part of the game, and should be taught, even to beginners, East will experience only a minor problem. Is the hand too strong for a two suited overcall? Vulnerability should convince East to slightly downgrade the East hand. Alternative competitive bids of 2D or double should not seem anywhere near as attractive. Why? Firstly, the possible bid of 2D. A suit headed by QT is not the strongest suit one wants to advertise to partner for an overcall, especially when you have two suits and the lower ranked suit is stronger. – an opening lead of this suit by West might be disastrous. One never bids the lower ranked suit first unless you are going to forget the other suit completely! Secondly a double in this situation is suggestive, in most partnership agreements, of a spade holding (there is no guarantee in this game) and a void hardly qualifies! Thirdly, a question one should allow to enter one’s thoughts might be, ‘Where are the spades?’. If partner has them, what would you do, besides wanting to disappear from the room, if you hear 4S by partner. If South has them, your double permits South into the auction and partner has no real description of your hand. Any subsequent bid by you might be a little too late. South, with a free bid of a number of spades, and North will eventually proceed to game in that suit. What do you bid after that? It is obvious from the score sheet that some East players mentioned diamonds at this stage, steering their side into an unplayable contract. Bear in mind the two suited overcall also forces South to enter the auction, not at the one level, not at the two level but at the three level, causing more reticence on his part to enter the auction on poorer hands. The bid has thus ‘Good pre-emptive value’ also. the space being for any possible South bid. In my opinion West, with a free bid, should attempt to barrage just a little with a bid of 4C. Five clubs would be a significant overbid, based on losing trick count at this vulnerability, and would invite a double. We have reached the optimum contract for East – West and, due to our choice of correct bids by East and West; simple to manage and expedient to arrive at. Now let us return and consider the whole deal. North opens 1H. East shows clubs and diamonds with a bid of 2N (Ghestem). Immediately South has a serious problem. A seven card suit is normally biddable! A seven card suit, headed by the nine, with six hcp is normally ‘not biddable’. Playing five card majors, the temptation would be to support hearts instead of mentioning the spades! Again from the score sheet some South’s may have chosen to bid hearts, thus avoiding their excellent game. North is highly unlikely to mention spades after a 3H bid. North will be faced with several choices after 4C. If South passed and knowing East has diamonds, North is unlikely to bid again and we will make ten tricks in clubs for +130. If South mentioned spades, North will compete with 4S. If South omitted to mention spades, and bid hearts, the temptation to bid 4H will be great. Finally, what should East do against 4H and 4S. Against 4H, East might double to prevent partner sacrificing. The heart holding looks like two tricks, a trick in the minors and a trick from partner anywhere defeats the contract. The void in spades is an extra bonus. Against 4S, East should pass! This invites partner to contribute! With a good spade holding partner (West) will surely double and with a poorer hand a bid of 5C will not be too expensive – one (-200) or two down (-500), doubled, scores better than the score of 620 to them. As it happens 4H should make eight tricks or nine with a defensive slip (+200 or +500) whereas 4S makes ten tricks and our sacrifice in 5C costs only 200 to them. Duplicate bridge at its best!